DASA Dortmund (German Occupational Safety Exhibition and Museum) hosted an exhibition of photos by Carl van der Walle from February 12 to April 30, 2006. For this purpose, interesting texts with cultural musicological references were created, accompanied by intriguing notes by Carl van der Walle (CvdW). We would like to thank DASA for allowing us to publish the texts. In the early years of the music scene, which we now call rock music, i.e., the 1960s, media marketing and sophisticated stage performances did not play any role. Closer to the origin of "making music", for the majority of musicians a simple stage would do – and, of course, their instruments. 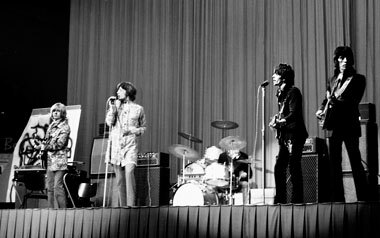 Therefore, it is all the more surprising that The Rolling Stones played a recorder during their gig in the Bremer Stadthalle in 1967 while the graffiti and the drum set of the opening act "Creation" had not been removed! 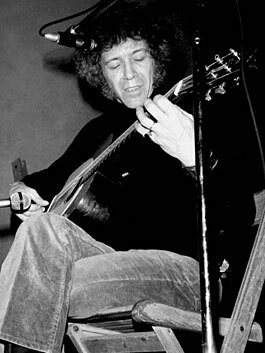 The simple curtain as the primary structuring element seems to be the adequate stage setting and, indeed, appears to be 'authentic' in the picture, which is unconceivable today for The Stones or other bands..
CvdW: "Alexis Korner is one of the musicians I particularly admire, not only because he "educated" numerous musicians such as Mick Jagger, Keith Richards, Brian Jones, Robert Plant, Jack Bruce or Paul Rodgers – but especially due to his distinctive appeal. I met him twice in 1972, and each time had the opportunity to talk to him. I remember when he smiled at a reporter's question, who wanted to know if Jimi Hendrix was one of his role models ..."
The protest movement of the 1960s is to be considered an important manifestation of a political idea in art. 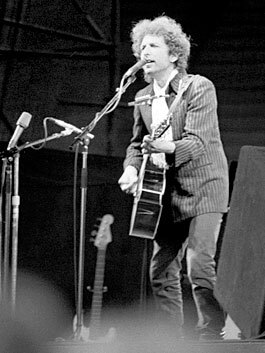 Many artists, among them the lyric poet and musician Bob Dylan, used simple arrangements, which were based on folk tradition, to address socially relevant topics. 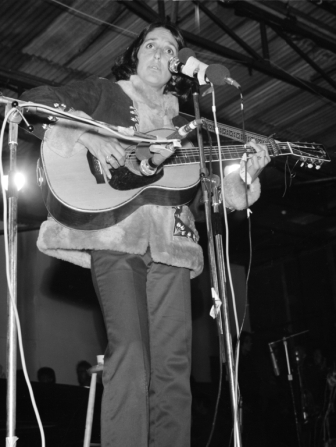 The singer and songwriter Donovan even went one step further and was singing together with three kids live on stage, representing the so-called 'generation of tomorrow", which artists supported with their pacifist and democratic attitudes. CvdW: "The grand times of the protest movement were actually over when Joan Baez, the icon of the movement, grabbed her guitar at the "Isle of Wight" festival. A highlight was her interpretation of the Lennon/McCartney song 'Let It Be'. The extremely capricious performer Bob Dylan was in a good mood during his gig at the M�ngersdorfer Stadion. 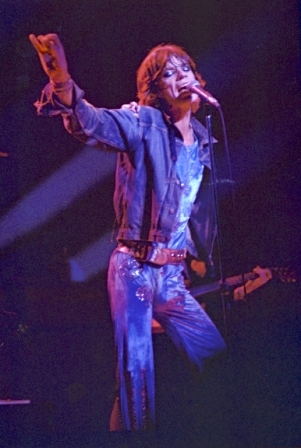 It was not surprising that his show was influenced by the sound of the Stones, as ex-Rolling Stone Mick Taylor and ex-keyboarder Ian McLagan of the Small Faces were members of Dylan's band. For me, this formation represented a successful synthesis, as both musicians, who were part of my favorite bands of the 1960s, gave the songs of Bob Dylan, whom I rather appreciate as a composer, a touch of rock music." A classic subculture was the Mods, who arose in London in the early 1960s, trying to combine the consciousness of the English working class with Edwardian elegance. Their icon was the scooter as well as a life style fluctuating between (drug-related) excesses and weekends of bourgeois conformism. 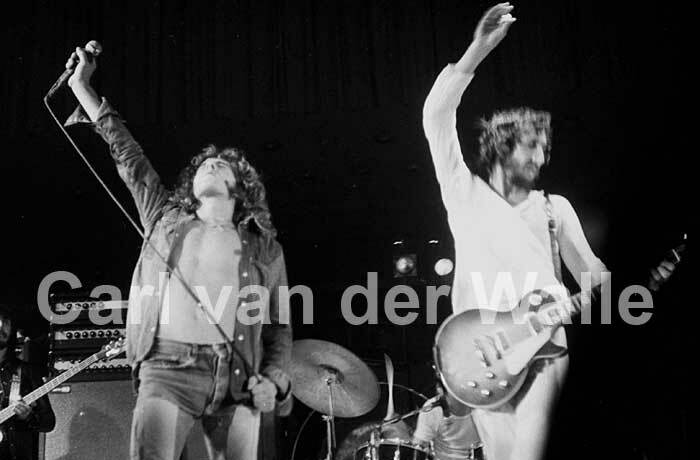 The Who, in particular, represented this ideal and became the identification mark of an entire generation. 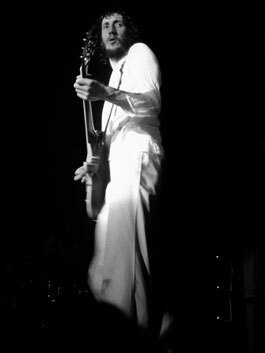 CvdW: "The mastermind of The Who was Pete Townshend. During the recording of this take, the band could again allow their guitarist to smash his musical instruments due to the huge commercial success of their rock opera 'Tommy'. Actually, I'm not a fan of orgies of violence on stage; however, these actions performed in the early days of The Who attained such a symbolic meaning that I definitely wanted to take a picture. Unfortunately, I did not succeed because I was operating a Super 8 camera at the same time. 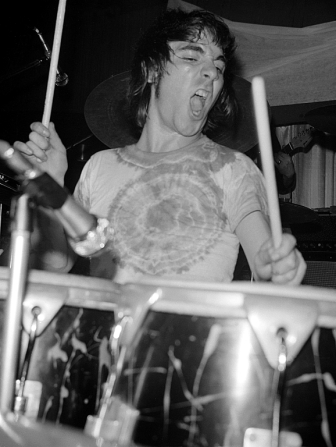 Keith Moon, the drummer of The Who, who unfortunately died very early in 1978, was one of the most vibrant figureheads in rock history; he embraced almost all clich�s of an eccentric rock star. I saw him live at a session with Pete York, Eddie Hardin, Tony Ashton, Miller Anderson and Keef Hartley in 1971, and here he gave a good account of himself as you can see." In the 1970s, social constraints were considered less rigid, not least because of the rebellion in the previous decade. Using sophisticated and complex, so-called psychedelic compositions, an aesthetic parallel world was created, a way "to drop out" from society and everyday life. Pink Floyd was the pioneer of a new conception of music. 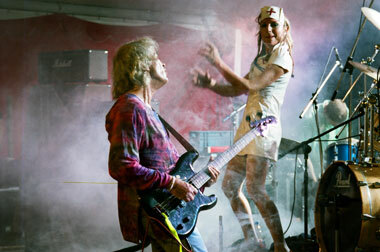 The band extended their legendary performances to holistic medial events, coming close to theatrical staging. 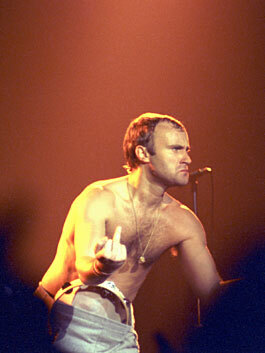 CvdW: "While performing in the Dortmunder Westfalenhalle in 1981, Phil Collins reacted to the hail of catcalls of some fans with this gesture long before Stefan Effenberg. He had just announced that Genesis, besides older songs, was also going to play some new tracks from the latest LP 'Abacab' which wasn't appreciated by every fan. The former front man of Genesis, Peter Gabriel, emancipated completely from earlier musical influences while this take was recorded. 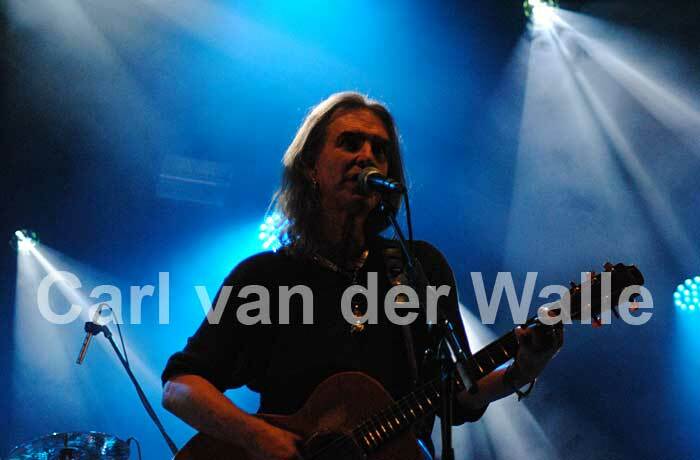 He played many songs of his latest album 'Peter Gabriel IV', which was strongly influenced by world music. 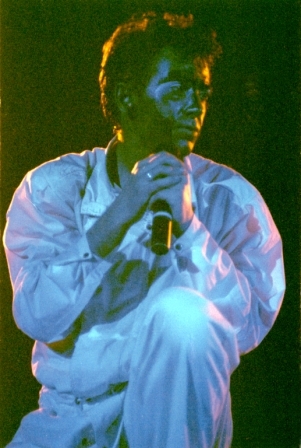 The photo was taken while Gabriel was performing the song 'San Jacinto', one of the most impressive songs of the concert." 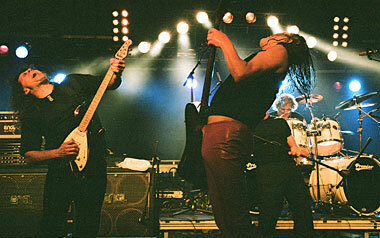 The German music scene in the decades after the Second World War was characterized by British and American influences. Seeking a national identity, a young generation of musicians mingled American influences with experimental sounds that characterized many local bands. The scene that we now refer to as "Krautrock" is not only influenced by the spirit of the 70s but has also become important in terms of music history, even if bands like 'Ihre Kinder' or 'Embryo' are probably little known today. 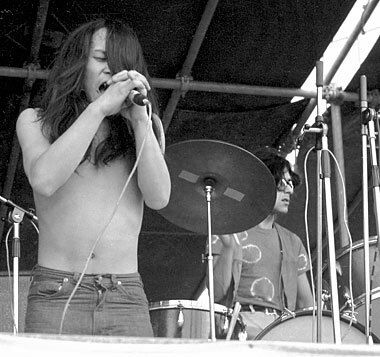 CvdW: "This photo of Can singer Damo Suzuki was the first close shot I took of a musician that I have really appreciated. 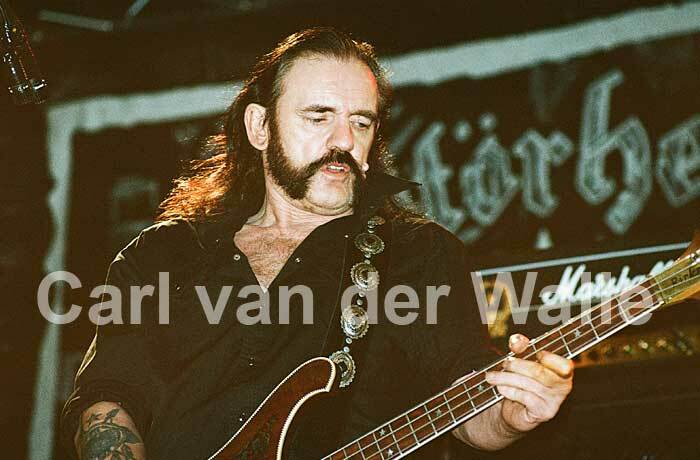 While Can was performing its gig, I was, for the very first time, directly in front of the stage and took this picture without a telephoto lens – because I didn't possess one. The Franconian Band 'Ihre Kinder' was one of the first rock bands which dared to sing German lyrics on stage. The band was pretty successful with its socio-critical messages in times of emerging Krautrock although it has never made it to the top of the genre." Making music seems to have become more sophisticated in the course of the years. The selection of photos clearly documents how concerts have evolved from a simple gig on stage to a sophisticated and highly technical major event. The selected frame may suggest that the music and sometimes even the musicians are pushed to the background, just as if they were hidden behind the security staff or stage scaffolding. CvdW: "A beat concert with The Rolling Stones in 1967. Today, the equipment would only raise a sympathetic smile in each amateur band – a simple curtain instead of a sophisticated light show. I remember exactly that the interior was provided with seats, and the audience remained obediently seating. 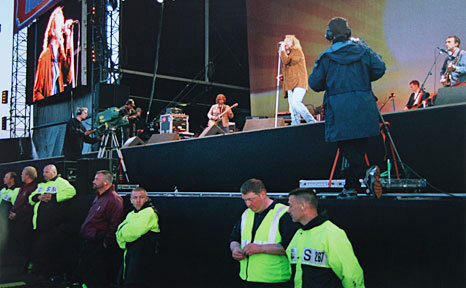 Nowadays, rock festivals can't be performed without strict safety measures and with a large force of security staff any longer. The close contact between musician and fan is no longer possible at such big events." On stage, it's rarely just about performing the individual songs; a concert is rather a combination of musical and visual elements. It includes the famous poses and gestures of the bands, especially of their singers, regardless if male or female. Are these poses and gestures an expression of a creative individuality or a macho pose degenerated into a stereotype? Without the accompanying music, the movements are particularly impressive, as if they were liberated from their original context. They give rise to questions and expose the musicians on stage. Sometimes you are not sure if these poses are a kind of narcissistic image cultivation or artistic self-realization. 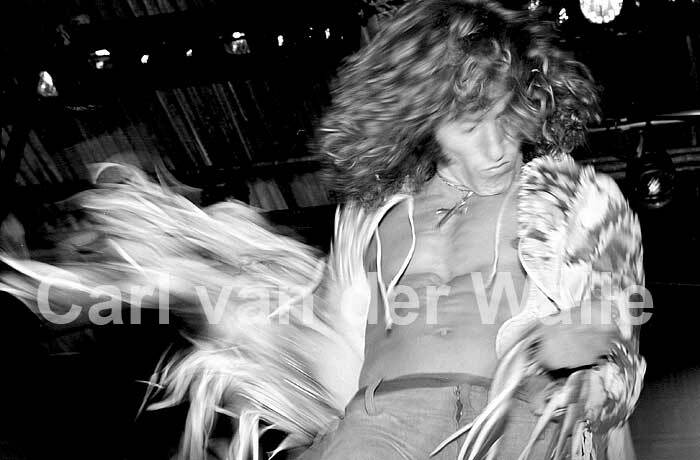 CvdW: "The poses of Mick Jagger in the 1960s took on a similar important role as playing the air guitar which was common in the 1970s. I think many poses make it easier for us to identify ourselves with these often extroverted stage personalities. You often could see little copies of the stars in the audience, and it was not only the outfit that was copied but sometimes also the poses, which has not changed down to the present day." The visual aspects of a concert are as important as the musical ones. Musicians are often part of, if not the creator of a particular lifestyle which we often describe as 'zeitgeist'. The band Mungo Jerry, sitting on the lawn during a press conference, is as an image just as meaningful for the late 60s and early 70s as the seemingly postmodern Space Ritual of the same band in the year 2005. 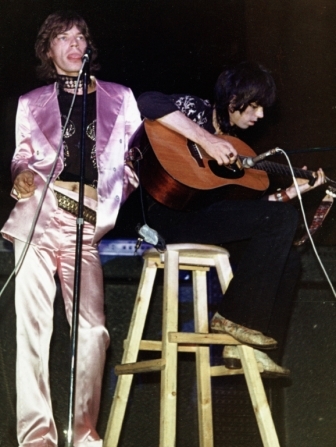 CvdW: "During an acoustic set, Mick Jagger and Keith Richards cantillated Robert Johnson's 'Love in Vain'. I was standing directly in front of the two of them, because the Hell's Angels, who were responsible for the security of the band and just about to shoo me, were sidetracked by a fight. The space rockers Space Ritual put on a breathtaking show in the style of Hawkwind, which was not surprising, as two of the founding members actually came from this band. The perspective of this picture is unusual because I was standing right next to the stage near the side stairs while waiting for a chummy photographer." 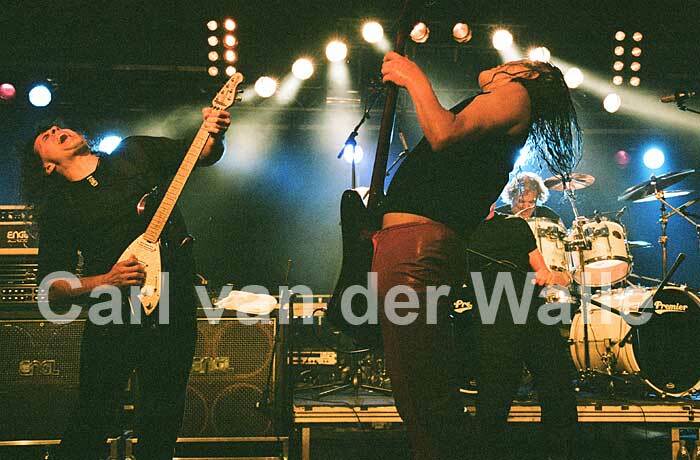 The classic instrument of rock music is the guitar, shaping the typical sound of many bands, and the lead singers often play the guitar as well. The 'traditional' band structure is extended by bass and drums; however, this is obviously not enough for some musicians. They try to extend the sound spectrum with everyday objects which are rather unusual for making music and experiment with a hammer, knife or scissors. So it is clear to see that also the aspects of the stage performance play a part. 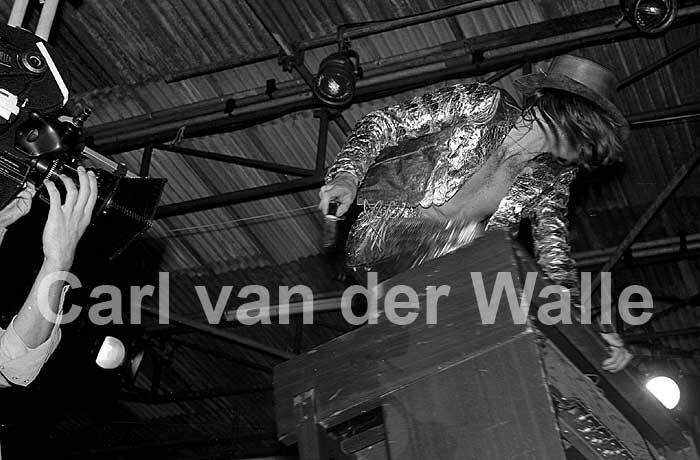 CvdW: "Keith Emerson was bothered about the fact that keyboard players mostly played a marginal role in terms of visual perspective, while the singer or guitarist is usually in the spotlight due to his show. 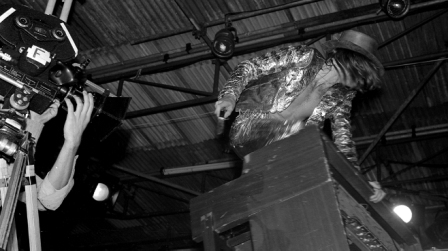 Thus, Keith Emerson, in his band Emerson, Lake, & Palmer, was responsible for integrating various show elements. He devised various methods to torment his organ; he dragged it across the stage, put it down to the floor, with himself lying under it, or he stabbed the keys with a dagger. 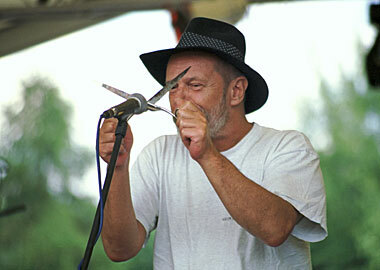 At a festival, Klaus Renft demonstrated how household items such as two spoons or scissors can be turned into musical instruments and then be misused. The Klaus Renft Combo was the most important band of the GDR in the 60s. It was expelled to West Germany in the early 70s because the band constantly refused to accept the statutory requirements of the political system. After the wall had come down, there was also a reunion of the Renft Combo." Why do people go to rock concerts? There are a number of psychological, sociological and cultural explanatory approaches. Certainly it is also about the collective experience, the experience in the large, anonymous masses. The size of the event plays a key role in the success of the event. decisive role. The more people come together, the more "shadowy" the artists become on stage. Sometimes you get the impression that you're in the middle of something, to feel a certain isolation among so many people. CvdW: "The picture doesn't deceive. 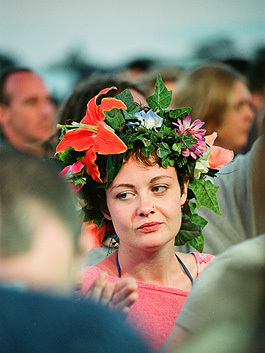 This hippie girl from our day was far and wide the only flower child at the Isle of Wight festival in 2002. In the midst of a rather moderate audience, she seemed almost lost. The trial of a revival of the legendary Isle-of-Wight-Festivals (1968-1970) was extremely viscous, even though later editions of atmospheric and were more successful. Dreams that were already dreamed out cannot be transported to other times." In the late 1960s, a version of rock music emerged from which blues and hard rock have evolved. This style of music rooted in the tradition of blues and R'n'B as well as in the garage rock of the 60s. The songs were based on famous blues patterns and were presented in a hitherto unknown explosive and loud way. 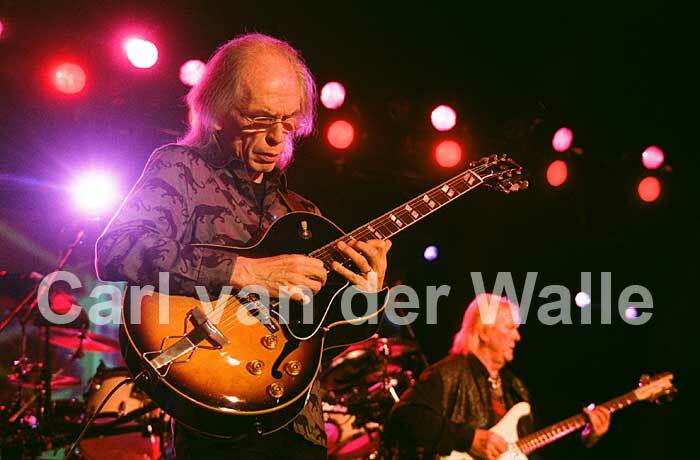 Besides the stars of the genre like Led Zeppelin, Black Sabbath and Deep Purple, it was particularly the British bands such as Uriah Heep, Ten Years After and Taste that shaped the typical blues and hard rock sound of that era. Uriah Heep released impressive eight LPs from 1979 to 1975 and has been very popular particularly in Germany. 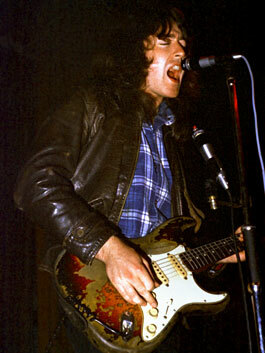 CvdW: "Rory Gallagher performed in the Philipshalle after the Taste had split up two years before. The congenial Irish man, who is one of my favorite guitar players, was able to cast a spell over the audience like nobody else. However, it wasn't until he became a solo artist that was really successful. 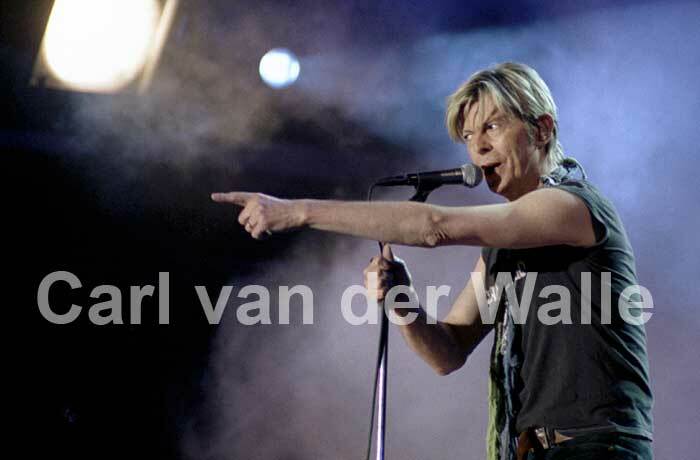 After his gig at the 'Aachener Festival' he explained the surprising end of the concert he just had performed. Gallagher was the headliner, and at 10 pm on the spot, the power on the stage was cut off. He had just played 30 minutes." A myth is created when we, often unconsciously, elevate a certain public figure. With then associate certain emotional values and associations with these stars, and the result is that these people are symbolic of a particular idea or vision of approach to life. Jimi Hendrix is a typical example. He is considered a myth, and his virtuoso guitar playing, hiss eccentric personality and his early death have turned him into an epitome of the rock' n 'roll lifestyle. Another example is Paul McCartney. He is representative of the Beatles myth. 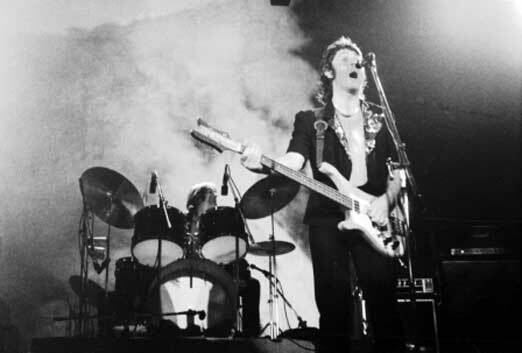 The very first super band stands for, among others, hysteria, success and creativity. CvdW: "Two years after the Beatles had split up Paul McCartney presented his new band The Wings on a European tour. Many Beatles fans were disappointed, as the band only played very few Beatles songs and, on top of that, only in medley form, as far as I can remember. 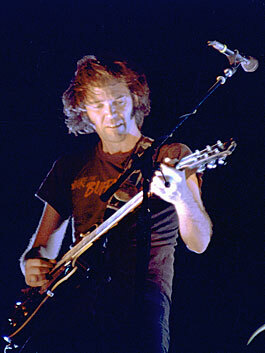 I remember the festival in Wiesbaden, where I saw Neil Young, with mixed feelings. Although it was a great concert, the crowd consisting of thousands of people in front of the stage was standing tightly together and developed dynamics so that I could hardly take any pictures."